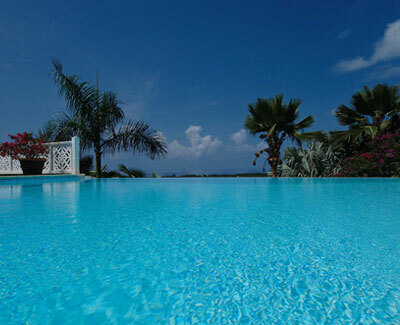 Located on a hillside in the Lowlands, the villa Callisto has superb sunset views of La Samanna and Bay Long. Located on a hillside in the Lowlands, the villa Callisto has superb sunset views of La Samanna and Bay Long. With a beautiful contemporary style decor, this 3 bedroom villa has a spacious open-plan living room and fully equipped kitchen. The living room has satellite TV, stereo and piano and opens directly onto a terrace with large pool and gazebo and outside dining and seating area. The 3 bedrooms each have en-suite bathrooms and air conditioning; the master bedroom features a four poster colonial style bed. Just minutes from two of St. Martin's most beautiful beaches, Long Bay and Plum Bay, Villa Callisto is the perfect Caribbean retreat.